Happy Halloween to you La Mom....it sounds most civilized, xv. The French make even Halloween more glamorous!!! Happy Halloween! I just gave my little crumb macaroons in her little pumpkin! Now, I'll have my pomegranate juice tinged champagne - festive, non? Happy Halloween! I must run and go and eat some of the hundreds of wee chocolate bars that my children collected door to door before they wake up and see me sneaking into their stash! Now that's what I call a Joyeaux Halloween!!!!! !I wouldn't mind bites of macaroons and bits of bubbly......! Too funny! Is some version of Halloween celebrated all around the world? 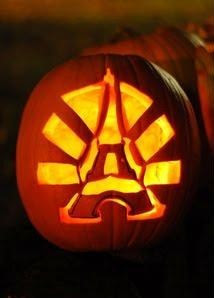 I'll take Halloween in Paris any day! What a fun!